It's not really my thing I thought, to write poetry in some other poet's style...but Billy Collins...I love Billy Collins. This really might be fun I thought. And I even have pictures of the lake I'll be writing about. At least I think I do. Well, even though I know I do have pictures of the lake, and recent ones at that - do you think I can lay my digits on them? 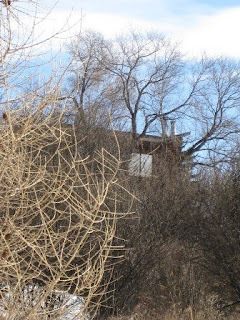 Of course not...and I have much to do before I wing my way east early next week so will settle for this secretive looking cabin I snapped a shot of in the river valley here. I think it suit this poem also. At least it works for me and I guess at the core, that's really all that matters.